Currently about half of the world lives without access to reliable energy to power their homes, meaning many people either have no access to electricity or they only have access for a few hours a day. This lack of energy means they have no way to power mobile phones, computers or televisions. Importantly, it also means they lack light and heat in their homes. Families make up for this lack of energy by burning kerosene, wood, dung or coal, creating indoor air pollution and harming their health. Billions in Change is aiming to help power the homes of people in rural areas through its Hans Free ElectricTM bike. The bike enables people in rural areas to generate their own electricity by simply pedaling. 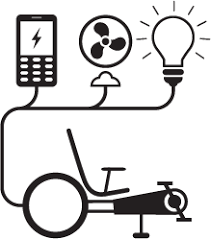 The system is simple: pedaling the bicycle turns a generator that charges a battery that can then be used in the home. Pedaling for one hour creates enough energy to run the average home in rural India for one day. Make no mistake, the system would not work in homes in rich countries as daily energy consumption there is far higher than the system could provide. But for people in rural areas where access to electricity is sporadic at best, it provides electricity on demand. They have no utility bill; they need not search for wood or dung; they do not stock kerosene or coal at home. Even better, it can work at night as it does not need sun and it can work when there is no wind. And it creates zero pollution.